Recently we were contacted by our local radio station 91.5 The Beat to see if we would be interested in their latest School Tour project. They were looking for a business that values community involvement to assist with their BUDDY BENCH initiative. We were glad they came to us and we could help with the project. This may have you wondering what we mean by “BUDDY BENCH” but we think the video below describes it best. This 3 minute video is a great example of what a BUDDY BENCH can do. Many children often struggle with making friends, joining in and/or finding someone to talk to. The idea of putting a BUDDY BENCH in a school playground assists the children that need a little help in this area. They sit on the bench and a spotter will come and sit with them and strike up a conversation. This little engagement can do a lot to improve the mental health and/or self esteem in kids. It also assists with stopping bullying at school. 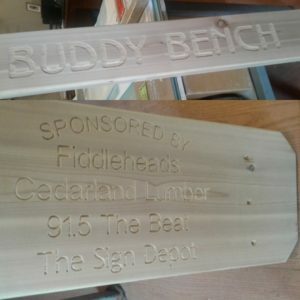 91.5 The Beat is donating BUDDY BENCHES to 3 local schools. Together with our friends at Fiddlesheads and Cedarland Lumber we assisted them with this important community project. Our involvement was to engrave the words BUDDY BENCH along with the sponsors names into the wooden bench. To do this we sandblasted the bench pieces to carve into the wood. Yesterday the first bench was donated to a local school and as you can see it was all smiles when it was received. Sandblasting wood is something we have been doing for over 25 years. If you want more info about our sandblasted wood signs please visit our portfolio and if you see something you are interested in please CONTACT US!